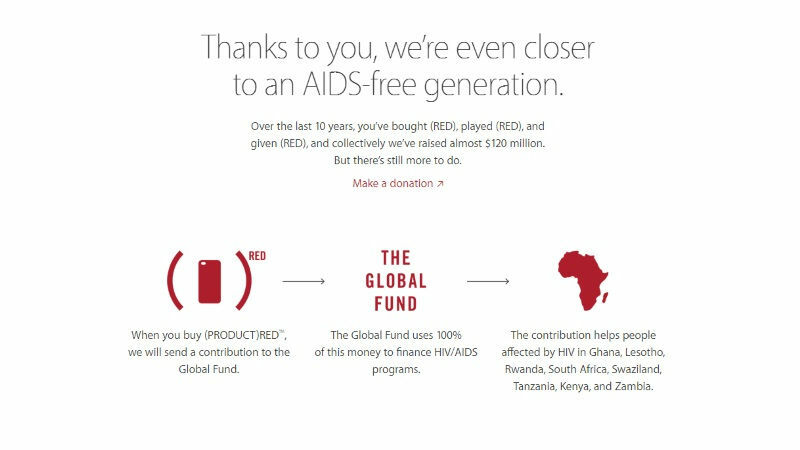 Apple has been raising funds for the RED charity in the fight against AIDS for the past one decade. The company has continued the support this year as well as the Cupertino-based company is offering special in-app purchases in 20 of the most popular games on App Store and selling four new (RED) branded products to support the cause, starting World AIDS Day, i.e., December 1. As a part of its support, the company is selling new RED (aka (RED)) branded products like smart battery case for iPhone 7, an iPhone SE case, Beats Solo3 wireless headphones, and Beats Pill+ portable speaker. The company is also offering other RED-branded products like cases for iPhone 7 and iPhone 7 Plus, Apple Watch Sport band, and iPod models. The purchase of every RED branded product contributes directly to The Global Fund in its fight against AIDS, the company said. Apart from the products, the company is also offering exclusive in-app purchases, on account of World AIDS Day, specifically meant for the RED campaign. The proceeds from all the in-app purchases will go directly to The Global Fund. Some of the popular games among the total 20 taking part in this campaign are Angry Birds 2, Boom Beach, Candy Crush Jelly Saga, Clash of Clans, Clash Royale, FarmVille: Tropic Escape, FIFA Mobile, MARVEL Contest of Champions, Plants vs. Zombies Heroes, and SimCity BuildIt. Notably, the special in-app purchases will be available for one week only. “Through December 7, Bank of America is giving $1 per Apple Pay transaction to (RED) and the fight against AIDS – up to $1 million in total,” the company said on its campaign’s page. Contributions will further be made for the campaign on every purchase of The Killers’ music album Don’t Waste Your Wishes. “The album features “I’ll Be Home for Christmas,” their 11th single for (RED), and is available on iTunes,” the company said. Those who are interested in donating money for the cause can do that by using Apple Pay directly at red.org as well. The contribution to this RED campaign is used to help people affected by HIV in Ghana, Lesotho, Rwanda, South Africa, Swaziland, Tanzania, Kenya, and Zambia. The company says that it has raised around $120 million in the last one decade since the campaign started.